This hospital is located amidst the beauty of tropical forest and on the banks of the famous ever flowing holy river Kumaradhara. The most famous pilgrim centers of south India namely Kukke Subrhmanya and Dharmasthala both are at a distance of half an hour drive. This hospital is away from busy vehicular traffic and concrete jungle. Served by polite, humble and innocent rural folk the whole area is very tranquilizing. Nearest Railway Station: 16 km Subrahmanya Road. Nearest Airport: 80km Bajpe, Mangalore. Hospital is constructed with mud walls and tile roofing. Surrounded by traditional arecca gardens from one side and tropical reserved forest from the other side, the river is always full of water and boating with coracle can be arranged. One can't even hear a sound of a vehicle at this campus. The whole area is covered with naturally grown medicinal trees. Delicious tropical forest fruits are available in abundance. Our experience is that one's ailment is half cured by just staying here. The treatments offered by this centre are; Basti Karma, Virchana Karma, Vamana Karma, Nasya Karma, Pizzichil, Netra Tarpana, Shirodharra, Localized Bastis and all types of swedana Karmas. This centre is specialized in the treatment of Kidney stones, vata ailments and digestive disorders. We provide the accommodation for six at a time. Mostly organic and locally available. Vaastu of the building is 95% and vaastu of land is 75%. Address: P.O. Ballya, Kadaba, Puttur Taluk, Mangalore - 574 221, India. One fine morning, when my mother was unable to get up from bed, we had not heard of such problem ever before! She was unable to raise her head up!! Visited by our family physician, father took her to a hospital few hours away from house. Rest of us were clueless of what happened!!! The specialist told she has problem of liquid imbalance in the ear, surprising though, as for the first time i learnt the ear rquires liquid balance!!! With constant in take of prescribed medicine, things were under control and she started the dizziness again when she stopped the medicine. That was when Dr. Suresh Koodur diagnosed my mother and let us know that it was VERTIGO!! He explained us the actual reason for this and available treatments for vertigo in ayurveda panchakarma! We didn't have a second thought to undergo the proven ayurveda treatment by the very famous practitioner Dr. Suresh Koodur in our area!! That decision did pay off! It was an unbelievable though guaranteed result from the doctor! My mother is completely cured of Vertigo post the treatment in Shree Poorna Chikitsalaya for nearly 10 days! Needless to mention the motherly care taken by Ms. Devaki Suresh and Dr. Suresh for all the parents would cure any kind of health problems. The food, the nature and everything was beautiful!! I bet, the one stop solution for Vertigo is Shree Poorna Chikitsalaya! Thank you Dr. Suresh, hail YOU!!! Place is verynice,peacefull and quite. people are here very friendly and healpfull. heart felt thanks to you and your family. The Panchakarma treatment for ten days at your center has improved my health a lot. Pain in hands legs and joints are almost gone now.My high blood pressure,cholestrol,old paralysis pain all are normal now. The timely Yoga ,exercise,homa, therapies,food, 24 hrs hot water arrangment has made my atay a very different experience. I felt very happy with your intimate approach towards your guests. I pray God that may every one comes here feel healthy by your treatments. Many many thanks Dr.Suresh Kumar for giving me a magical releif. I was not able to study or do anything before consulting you. Thank you for your hospitality, given to me in my stay at your home. Thanks a lot for the kind of treatment given by you . The food served by you was great, also the mangoes I picked were very tasty. I would like to come again during next mango season. I enjoyed the treatments like body massage,steam , shirodhara etc. Above all starting the day with Agnihotra Homa ( fire ritual) I liked most. Thank you so much for having us here during your busy schedule. We really enjoyed the hospitality received,treatment and nature.We enjoyed the food prepared by Devaki. It was very healthy and tasty.Yoga sessions were great. 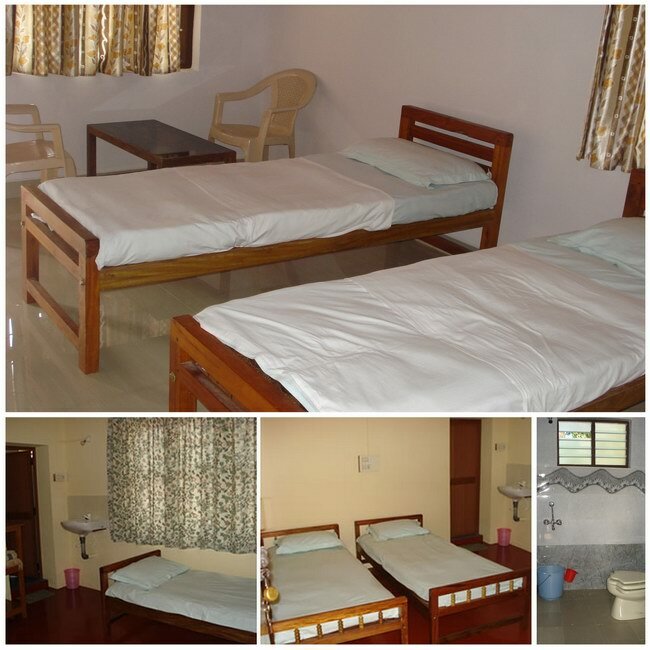 Rooms, treatment rooms and rest rooms are well maintained. I feel light and full of energy after the panchakarmatreatment. My knee pain has reducedto a great extent after the lepa application here. Thank you very much to the family and staff of Dr. Suresh for making us feel at home. The last 10 days spared amidst you are forever engraved in my memory for all the love and effection bestowed. God bless you and every one associated with your noble work. I enjoyed my stay at Shreepoorna.Great Doctor and family,wonderful staff.I enjoyed your hospitality.I loved my stay here,enjoyed beautiful nature river,forest and chirping birds.I received nice Panchakarma treatment. Food was great,Yoga session was beautiful.It was nice experience. Thank you all , very much. Dr.K.Sureshkumar, an Ayurvedic doctor, appears to have combined effectively his treatment with that of nature. Where else one could find it? It is in Hosmath, amidst thick vegetation, on the bank of gently flowing Gundia River, to the sound of ever chirping birds and living creatures. This is manifested when he treated my knee injury. What hospitality! All smiling staff, gentle, soft spoken locals serving me.The food treatment oriented but tastily prepared AYURVEDIC RECEIPS. The treatments, like Shirodhara, oil massage, application of herbal pastes, followed by light exercises: so confidence building measures that made me come out fully satisfied.Now I feel that my knee is better and I could walk around freely. Thanks to DR. Suresh and his wife for their support. This is Eliana, I spent three weeks in october in Shreepoorna and it was a very important experience expecially for the full immersion in the indian culture I had therre. What I use to say is that I had a "homemade" panchakarma, often I liked it but sometimes it didn't make me feel it was working well. The food was tasty, plenty and very healthy (I choosed not to have sweets and not too much milk), the Doctor and Devaki his wife have been very caring: they looked after me, took me around, helped me with shopping, tought me a lot about the plantation and indian culture, and made sure I never felt lonely...sometimes it was even hard to spend some time on my own :-). What happens is that you live in a farm in the middle of the plantations, it's gorgeous, you really are in the nature but don't expect a complete silence, the smiles of the workers make your moments lovely but the farm life keeps going day by day and this often means noise. Unfortunately my expectations were very high, I really wanted to get rid of my eating disorder but it didn't work. When I came back home it was good and I felt better then when I left but I still didn't feel a very strong effect. I was still waiting for it when, after two weeks, I started again with my bad habits. I'm not saying it's not worth to do panchakarma, it's anyway a good chance to clean up your body but I just want to warn not to expect to fix any problem with it. Thanks a million for all the things you have done for us and unforgetable trip to Subrahmanya. I enjoyed my stay here and enjoyed the farm. Thanks a million again ,hopingto see you again.God bless you all. Dear Dr.Suresh Koodur & Mrs Devaki , Thank you for your hospitality,and care given to us for past 10 days. Your hospital exeeded our exectations. The treatment was very good, and you are surrounded by friendly people and staff. We liked the farm very much and we saw so many things we didn't see in the past. The yoga sessions were very good & educational.I hope to get better with yoga but finding it difficult to do without your help. You and your wife are a very loving and caring people. Praying to Almighty God to bless you & your family and your hospital so that many people come and get healed. Hope to see you and your family again.Thanks a million. Thank you for making me feel welcome in your hospital.I had a wonderful experience living in and in tune with nature.I enjoyed the food , the treatments were excelent.I most enjoyed the company and friendlyness of the people living here. I found my time here most educational, learning about farming,gardening and Indian culture and also about myself! Since the Panchakarma treatment I feel much better and even decided to stay a few days longer since I liked the place so much. Thank you for all your loving care! I had excellent, very much personalized treatment here. I recommend this place to everybody who is looking for authentic ayurveda (more to follow later). I had a very bad head ache for past many years. My head ache was aggrevating as the sun goes overhead and it continued till late evening. 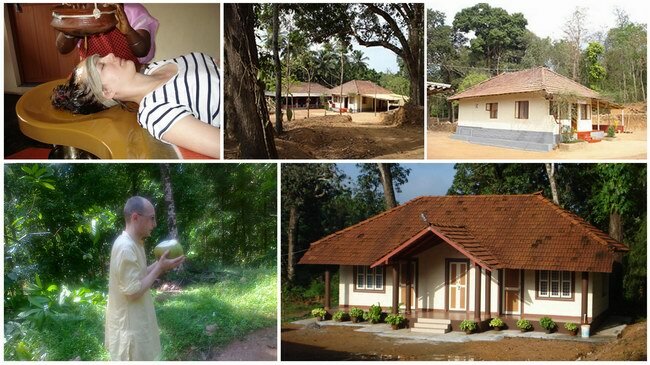 I stayed at this centre for ten days and I was given panchakarma -vamana- treatment.Dr. Sureshkumar was always with me observing any change which took place in me.Now my head ache is fully gone. Now I don't get head ache even after two months of panchakrma.Now I am able to work whole day in the college ,some times in bright Sun also. Devaki Madam in perticular for their homely and affectionate hospitality. Price was affordable.I liked the Agnihotra and Yoga session very much.Even now I am doing Pranayama and I enjoy doing it.---Radhakrishna Ramakunja. I had the opportunity of attending Panchakarma at the center last month and I recommend the same to people suffering from stress, arthritis, body stiffness, neck pain, headache and other nervous and respiratory problems. After a thorough evaluation and determining my body type-prakriti and vikruti, the doctor recommended a weeklong Panchakarma treatment. I was shocked at the deep detoxification that occurred during and after Panchakarma treatment. The technicians were very attentive and nurturing during the Panchakarma process, everything was enjoyable. I could feel the stress going away and energy level going up. A very light and nutritious diet prepared by highly talented and vocal music exponent Mrs. Devki kudoor ( doctor’s wife) who has been helping in running the center with Dr. Kudoor. It is said one gets better off in health by feeling at home rather than by medicine. I could not have dreamt of you making me a member of your family, something I much enjoyed. I have also learnt about birds and innumerable herbs and other crops like cocoa, black pepper and arecca nuts etc. 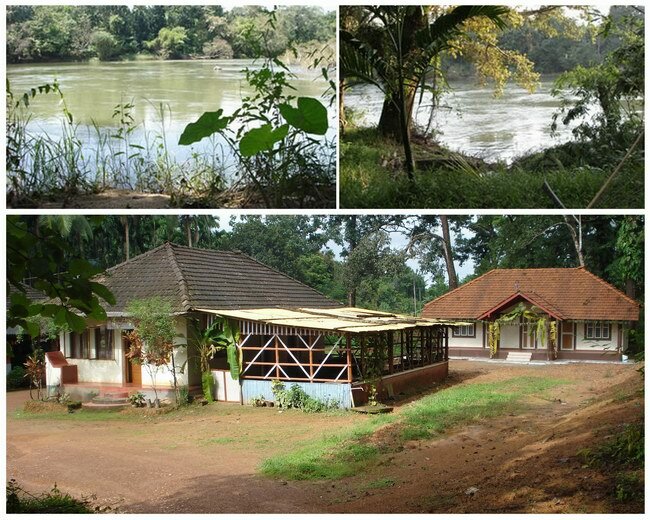 grown around center surroundings and the beautiful stream passing between the center and the river kumardhara flowing just at the back of the coconut trees. The arrangements from food to service, yoga and rejuvenation programmed-everything was superb. I will certainly recommend this peaceful place to all my friends. I am looking forward to coming back next year. My heartiest congratulations and thank you for the wonderful experience, I had in your Panchakarma center. I was impressed by your efficiency, friendliness and complete professional approach towards your motto ATITHI DEVO BHAVA inspired me to undertake this treatment. The impression continued from my arrival at the center until the day of my discharge. Your uniqueness lies in your simple yet very effective technique and attitude, which made us feel at home. The center is brilliantly located amidst coconut and arecca plantations and awesome surroundings away from the commercial noise, close to roaring river kumardhara. The roaring waves make you sit there at the banks and watch the river continuously for hours. The day used to start with Agnihotra Havana followed by pranayama and light breathing exercises and end up with oil massage and other herbal treatments being applied form time to time and according to the needs of the individual. After the Panchakarma we could feel the stress going away and our energy levels were up. We highly recommend Panchakarma and diet consultation with the esteemed doctor who is serious about leading healthy and joyous life. Perhaps it is the euphoria of feeling better. There are no words for my delight. I have been deeply effected by this experience, mentally, emotionally, spiritually and physically. Stay at Shreepoorna was a remarkable journey of several dimensions. To begin with river sight and all of land is peaceful and beautiful . Then there was experiences of panchakarma under the guidance of thoughtful and knowledgeable Dr. Suresh Kumar Koodur.His presence was felt every step of the way. Many insights into picturesque and diverse fabric of India and life in India were offered . Pranayama was guided daily.Food was very good , always fresh and Ayurvedic in principle. been helpful and alert to any of our ( my wife's and my own) needs. Learning about plants was an extra bonus. This experience transcends time and place. Our stay has been most enjoyable,with amazingdaily food,daily attention from Dr.Kumar,but most of allwe appreciated the beautiful nature,quiteand peaceful sounds af birds and crickets every morning and evening. THe whole experience has been highly educational and we are greatful to the whole family for their willingness to allow us so fully into their customs, their culture and their dining room too! We feel the warmth af not only their hospitality but also the welcoming embraceof the earth, land, and sky of India.We feel heartily blessed and are so grateful for this mind-opening educational experience. It Is really wonderfulplace.Here doctors take very personal care about us.HERE we cured from our all physical diseases. I could not believe myself, when I finished my ten day program, even my wife took a second to confirm whether she was seeing me!! In fact the Panchakarma has enabled me to tone up my body and get rid of 12 kgs of unwanted stuff, which I was carrying day in & day out with me, straining my knee joints. Apart from the quality of treatment, it is a great experience to watch the passion Dr. Suresh Kumar treats his patients. With ever smiling face, always listening ears makes you feel more than at home. Even his better half Ms Devaki takes care of the so called patients as their guest in their own home and ensures that you do not feel unattended. I have no hesitation to recommend to one & all to make it a habit to visit & get recharged once a year at least if not more frequently, to live & experience not only Satwik Life buttotal rejuvanation in a very healthy atmosphere. Keep it up Dr. Suresh Kudoor of Shree Poorna!! Congratulations to team Shree Poorna for successful treatment of chronic deseases and filling confidence in your patients. Mr. Periam Pillai of Bahrain would like to visit & get rejuvanated in your Clinic every year it semms. Please Help him to get back his original life! sure you only can do this in such a wonderful setting on the bank of river inside the ever green forest surrouned your centre. I am from Mysore. I have been suffering from bone cancer for two years now.I took radiation therapy. After that I was very weak physically and of-course mentally also. Same time fortunately I got in touch with Shreepoorna. I was given shodhana chikitsa and brimhana chikitsa for ten days. During my stay there was Agnihotra, Dhyana and Pranayama class also. I was given followup oral Ayurveda treatment for six months. Now my cancer specialist is surprised to see my improvement and he is thinking of stopping all drugs. Thanks to Team Shreepoorna. 100 meters north from cottage where I lived is the origin of stream from mountain and 100 meter down south you can witness the same stream joining the River. My Primary purpose of stay was Panchakarma treatment, which I would rate 10 on 10. Panchakarma treatment for 10 days@Sheereporna was very Relaxing, Refreshing, Rejuvenating, Re-energized. One should try it to Believe it. I would like to thank Dr. Suresh & his Family and people @ Sheereporna for taking a personal care and making my treatment a success. Dear Dr.Suresh Kumar & Devaki Mam Thank you for your hospi ..